The European Parliament rejected yesterday (4 July) the controversial Anti-Counterfeiting Trade Agreement (ACTA), dealing a blow to European Commissioner Karel De Gucht, who sought to dissuade MEPs from voting on the international treaty before the European Court of Justice gave its opinion. The vote – 478-39 with 165 abstentions — put the last nail in the coffin of the controversial pact although other countries are expected to carry on with it. So far the United States, Australia, Canada, Japan, Morocco, New Zealand, Singapore and South Korea are among the countries that have signed but not ratified the trade agreement. Although MEPs feel there is a need to standardise international laws that protect the rights of those who produce music, films, pharmaceuticals, fashion goods and other products that often are the targets of piracy and intellectual property theft, they also feared the treaty as it stands could lead to censorship and a loss of privacy on the Internet. "The vote against ACTA was not one against the protection of intellectual property,” said the Parliament President Martin Schulz. “On the contrary, the European Parliament staunchly supports the fight against piracy and counterfeiting, which harm European companies and pose a threat to consumer health and European jobs." This is why MEPs decided to disregard De Gucht, who urged them to wait for the Court of Justice ruling before voting. Such a procedure could take up to two years and MEPs did not see the point in waiting. Despite the resounding defeat, De Gucht said the European Commission would continue to seek the court’s opinion. "It's clear that the question of protecting intellectual property does need to be addressed on a global scale — for business, the creative industries, whether in Europe or our partner countries," De Gucht said. "With the rejection of ACTA, the need to protect the backbone of Europe's economy across the globe: our innovation, our creativity, our ideas — our intellectual property — does not disappear." The treaty was unanimously approved by the 27 EU heads of government in December. But EU efforts to ratify the pact hit a wall of protests earlier this year. A petition against ACTA garnered 2.8 million signatures. Such a movement pushed the Commission to seek the advice of the Court of Justice. BusinessEurope, the European employers' group, was supportive of ACTA and called on MEPs to wait for the EU Court of Justice ruling before voting on the text. "European companies support ACTA and ask MEPs to vote in favour of adoption of this very important international agreement", BusinessEurope said in a statement. "We regret that the parliamentary debate has become so controversial and maybe on the verge of voting against ACTA," the association said before the vote. Oxfam strongly welcomed the Parliament’s vote against ACTA, according to the NGO's spokesperson Leïla Bodeux. “The European Commission, who has been a significant driving force behind ACTA, must now refrain from seeking to introduce any other rules that would endanger the lives of people needing affordable medicines in the developing world,” Bodeux said. “ACTA was drafted to allow itself to be revised without consulting the European Parliament. Such a power grab has thankfully been repelled,” stated Director-General of the European Consumer Organisation (BEUC) Monique Goyens. The Federation of European Publishers (FEP) considers the Parliament’s vote damaging for European intellectual property, jobs and the economy: “Unfortunately the treaty got off on the wrong foot in the Parliament, and the real significant merits of the treaty did not prevail,” Anne Bergman-Tahon, director of FEP, said. “While we welcome the Parliament’s efforts to be seen as responsive to public concerns, organisations representing sectors employing over 120 million workers in Europe were calling for the adoption of ACTA,” said Jeffrey P. Hardy, director for ICC’s initiative Business Action to Stop Counterfeiting and Piracy (BASCAP). “Parliament says no to ACTA but stresses that ’global coordination of IP protection is vital’. We respect their position,” added Johannes Studinger, head of UNI MEI Global Union. “I am delighted we have said goodbye to ACTA once and for all,” said member of the Scottish National Party and MEP Alyn Smith. “We need to see improvement in the area of copyright and patent enforcement without the impairment of civil liberties and access to information and medicines,” he added. “We welcome the support of a decisive majority of MEPs for rejecting ACTA today; this is the just and democratic response to the mass mobilisation by citizens across Europe against ACTA,” Swedish MEP and group spokesperson on ACTA Amelia Andersdotter of the Pirate Party said. ACTA was first announced in late 2007, when the US, the EU, Switzerland and Japan said they would negotiate a new intellectual property enforcement agreement to counter the trade of counterfeit goods across borders. According to former trade negotiators, EU countries attempted to clinch an agreement under the banner of the World Intellectual Property Organisation (WIPO), but as members could not agree, like-minded nations formed ACTA. The 52-page treat was signed by the US in October 2011, along with Australia, Canada, Morocco, New Zealand, South Korea and Japan. On 26 January 2012, 22 European countries and the European Commission signed as well (the remaining being Germany, the Netherlands, Slovakia, Estonia and Cyprus). The Commission supports ACTA and sees benefits for European exporters and creators, ensuring they profit from a level playing field worldwide. The agreement will enter into force after ratification by six signatory states. None has ratified so far. European United Left / Nordic Green Left (GUE/NGL): No to ACTA! The is incorrect. 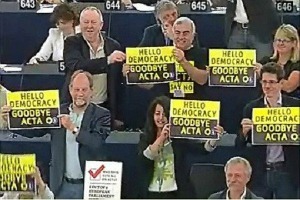 Over half of their MEPs voted (rather than abstaining) and three quarters of them opposed ACTA. Great! My opinion of the EP has just been greatly improved. May the Parliament always decide for the good of the people and protect the people’s interests. Let’s just hope that national parliaments don’t start introducing it(ACTA) on their own accord now. Yes we are in the EU, but I sometimes disagree with some of the decisions made in the EU. For example the Comission wanted ACTA to pass and only asked the Court of Justice after massive protests; and they still will wait for the Courts decision. As for the Ethylotest(alcohol test) in France, what about it? I haven’t heard anything. In Spain one must take these tests in traffic controls, especially on weekends, for road safety. I don’t know about other countries. I think there is harmonisation going on in the EU regarding transport safety as well.